We are instrumental in providing our clients a comprehensive range of Wire Nails Making Machine. 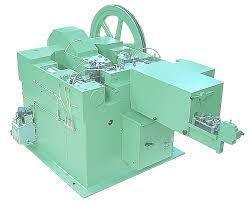 The offered machine is used for making wire nails in different sizes. Designed and manufactured by our experts as per the set industry norms using quality approved raw material with the help of advanced technology, this machine is checked on various quality parameters. Available in different specifications, this Wire Nails Making Machine can also be customized as per the requirements of the clients.